Ask fellow campers about "Diamond Lake RV Park" and nearby attractions. We stayed seven nights in a 40 foot fifth wheel. The park and check in is across from the bar/restaurant. Don't confuse this park with the National Forest Park. This is a great park that is very convenient to the north entrance of Crater Lake NP. The interior roads are paved and most of the sites are gravel. Some sites have a patio area. Our site was not level side-to-side and the way they mapped out sites is a bit haphazard. For instance the site next to us backed in at an angle toward our site. Folks this is a very dry environment and conditions are dusty so just be prepared. With all the fires and being late in the summer season we were understandably under a burn ban. 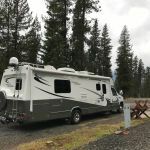 We camped at Diamond Lake RV Park in a Fifth Wheel. Visit Crater Lake. Hike some of the rim trail. Pick up the brochure in the office and take the waterfall hikes. Awesome. Easy walk from campground down to restaurant for pizza, beer, and/or ice cream. We planned to visit Crater Lake National Park and this park was perfect for our needs. It is a 5 min drive to the north entrance and about 20 min to the overlook. Access is excellent. We came from Roseburg via 138 and my RV GPS directed me to turn on Diamond Lake Loop. You can pass that turn and take hwy 230 to the Loop road and avoid the back road. Check in was easy and I was directed to our site by the assistant. The site was level and long enough for the RV and car but my slides brushed the branches. Our site was tight with our neighbors, others looked more spacious. Hook ups were good, my water was about 26 feet away, good to have a 50 foot hose. The site had a small concrete patio which was great at the door but lacked a fire ring. I did note other sites had fire rings. There was a small picnic table too. The office has $1 DVD rentals, logo shirts and a few sale items for laundry. No Wifi, no AT&T signal and no OTA TV. As noted in other reviews, the day use area down the street had four bar 4G signal. We camped at Diamond Lake RV Park in a Motorhome. Crater Lake NP has great hiking. Several trails offer unique vistas. The trolley tour ($27/adult) is worth it. Each tour is lead by an interpretive ranger and stops at several places along the Rim Drive. The closest Wal Mart is 77 miles away in Klamath Falls, the nearest grocery store is about 30 miles. There is a small convenience store in Diamond Lake with gas pumps. We stayed here on our 38 day Northwest Caravan. The staff was friendly and very helpful. The check in process was simple and they guided us to our sites. We had a back in and a separate place to park our vehicle. Our group was close together and we sat outside each night and enjoyed the mild weather! Phone coverage was spotty, but OK. We camped at Diamond Lake RV Park in a Motorhome. Best stay near Crater Lake. Friendly office staff. Guided to a spacious, wooded site. All utilities worked well. No wifi or cable, but didn't care with so much gorgeous country around. We camped at Diamond Lake RV Park in a Travel Trailer. Crater Lake, of course. Also lots in numerous other parks in the area. The park was very nice and quiet - no cell, internet or satellite TV but as long as you are OK with that it was great. The great news is that you could walk about 1/2 mile down the road into a small day use picnic area and get excellent ATT connections. There were no mosquitoes so we sat outside every night and enjoyed the solitude - beautiful night skies as well. Very close to Crater Lake NP but unfortunately for us it was terribly smoky there the 2 days we were there - we will be back! 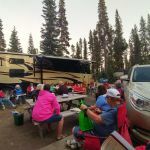 We camped at Diamond Lake RV Park in a Motorhome. The park is nestled in the trees and is very quiet. The roads are asphalt and the sites are a thick layer of large gravel. Our site was A1 which is one of the "big rig" sites and is very secluded. We faced the forest with no other campers in sight. It was surprisingly level. Our rooftop Trav'ler dish was able to get DirecTV HD which made up for the fact that cell service is really marginal. You can make voice calls on Verizon but data service is very weak and slow. With the drought, the mosquito problem noted by others earlier in summer was nonexistent. We sat outside on the concrete patio most evenings. Our picnic table was quite satisfactory and fires were almost forbidden due to the extreme wildfire risk. Bottom line is that this isn't a fancy park, but a very nice one if you want to get away from the world and enjoy sitting under ~100 foot tall pine trees. An important point to note is that although the RVPR map pin for this park is in the correct location, the Google map pin is WRONG. Google has the pin for this park labeled as "Diamond Lake Trailer Camp Area". If you set your GPS to that you are fine. If you use the Google pin for Diamond Lake RV Park you will be ~3 miles north at the resort and may have difficulty turning around and getting out. Don't make that mistake! We camped at Diamond Lake RV Park in a Motorhome. This park is a great base for exploring Crater Lake; the north entrance of the park is ~10 minutes away. Even though cell service at the park is weak, the good news is that if you drive ~2 minutes to a lakeside picnic area on Diamond Lake you can get blisteringly fast Verizon LTE/4G service. The picnic area has tables and restrooms and our daily ritual was to take our laptops and readers down there for a couple of hours each day. The good news, however, is that if you drive ~2 minutes to a lakeside picnic area on Diamond Lake you can get blisteringly fast Verizon LTE/4G service. The picnic area has tables and restrooms and our daily ritual was to take our laptops and readers down there for a couple of hours each day. This park is nestled among trees in a slightly sloping terrain. The check in was fast and courteous. They lead you to your site and make sure you know where the utilities are located. Some are in strange positions but all worked well. The site we had was A-1 for a larger coach and tow vehicle. The pad is fairly level gravel and there was plenty of room for both vehicles. The table provided is a joke; all broken and splintered. There is a fire ring which we did not use. A small concrete pad is provided. This site is one of a few that gets satellite reception. Cell reception was one bar at best with most calls dropped. We could use our Verizon hot-spot. If you have a dog(s), be sure to keep it leashed at all times. The park is not very dog friendly. We used the laundromat which was not well kept, however priced below average. The roads are broken asphalt and gravel. The park overall needs TLC....sooner than later. We camped at Diamond Lake RV Park in a Motorhome. Diamond lake is across the street, about 200 yards away. There is a marina, lodge and restaurant. We rented a 16' boat with bimini top and the day rate was $105.00. Right across from the park is a pizza/chicken/ice cream shop and was always busy. We drove to Crater Lake for the drive around. It was packed with vehicles and tour buses, even on the Monday morning we visited. It is beautiful lake with lots of history. Well worth the 4-5 hours you will spend driving and visiting. We stayed 6 nights, our site was small but we were able to get satellite TV, which is not easy due to the tall trees. Most of the sites are large with plenty of space. Friendly campers and our dogs were in love with all the squirrels and chipmunks. The laundry room was clean. Make sure you bring plenty of Off, the mosquitoes were terrible. The lake is across the street and we had fun fishing from shore. I would have rated this campground higher, but our check-in experience with one of the attendants was unpleasant and disappointing after a 7 hour drive. We camped at Diamond Lake RV Park in a Fifth Wheel. Fishing at the lake is fun, and would have been better if we rented a boat from the resort. There is a very good pizza and chicken restaurant right across the street. If you want to get away from it all - this is the place. No WiFi, no cable, and very little cell service. Sometimes, you can make and receive calls. Having said that, this place is like a NFS campground. It has that feel ...with full hookups. They really help guide you into your site - very helpful. The campground has that great smell of pines. Be prepared for mosquitoes - many of them. If you want to fish Diamond Lake, your best bet is to rent a boat. And, don't bother trying to fish Lemolo lake. Ugly and full of algae I believe. The big attraction is Crater Lake NP. Don't miss it. There is one gas station near the Diamond Lake resort, and one at Crater Lake...both very pricey. Be prepared. We camped at Diamond Lake RV Park in a Fifth Wheel. Bring your groceries - not much available nearby. We wanted to visit Crater lake and this RV resort fit the bill for being close by. For traveling reference, yes, there are challenges with computer directions....as long as you remember that this resort is on the southeast corner of Diamond Lake. Google maps directs you to the resort which is 3 miles north. The park is surrounded by trees and feels like one is communing with nature. There are a fair amount of mosquitoes during the "peak" time in morning and evening. AT&T reception is nonexistent and Verizon is spotty and overwhelmed. Water quality at this place is great because it comes from a natural spring and untreated. We filled up tank for boondocking before we left. We camped at Diamond Lake RV Park in a Fifth Wheel. If you have bicycles, try to do the 11 mile loop around the lake...it was gorgeous. I had to stop several times for photo opportunities. The paved trail is easy to navigate and not hard to do. As advertised, the park is a bit challenging to find if using your GPS. Putting up some additional signage along the way would help travelers. Our lot was pretty un-level, but we made it work. We had a picnic table that was located conveniently (on the door side of the camper), however, the fire pit was in back of the rig which seemed to be an odd location. The park is well located to travel to Crater Lake National park and to several waterfalls. 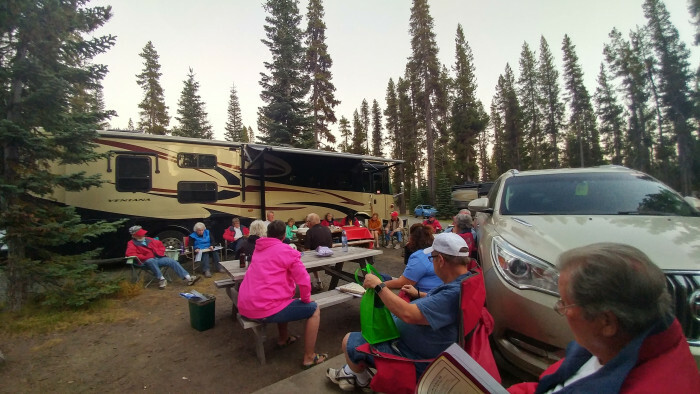 We camped at Diamond Lake RV Park in a Fifth Wheel. Adding a trip to Crater Lake National Park is very easy to do from this location. 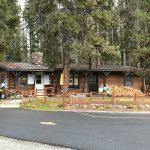 We also visited the Diamond Lake Resort for a bite and a beer. Spent several nights at this park. Great location for Crater Lake visits and many waterfalls. Friendly hosts and very nice sites. 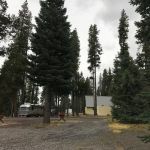 We camped at Diamond Lake RV Park in a Travel Trailer. Sites are gravel/grass but we had no problems with a 45 foot. We were easily able to level - but there are other sites that look more difficult. If you need satellite- ask in advance as there are only a few spots that will work. I throughly enjoyed the on site manager - helpful, engaging - fun - so I have no idea what some of the other comments refer to. We had a view of the lake and mountain - filtered thru the trees. You are in the woods and it really is a nice atmosphere. If you need GPS - use the coordinates on the web site - any others are incorrect. Some of the patio's are in good shape - others broken up but all in all we would stay here again. We camped at Diamond Lake RV Park in a Motorhome. A little too primitive for me. Lots of bugs and no cable, Wi-Fi and most of the time no cell service. Most sights appeared very unlevel. Needed lots of blocks to bring up low side. RV connections a very far apart IE: sewer, electrical and water. All sights and interior roads are gravel. Very beautiful setting in the forest. You may love it, but I prefer a little more conveinience. We camped at Diamond Lake RV Park in a Travel Trailer. We camped here two nights to visit Crater Lake and love the campground and the area. We have a 40 foot motorhome towing a car and were in site A-1 in front of the office. Our Direct TV worked and we had two bars of 4G on the Verizon. We camped at Diamond Lake RV Park in a Motorhome. This park is a great base for exploring Crater Lake; the north entrance of the park is ~10 minutes away. Even though cell service at the park is weak, the good news is that if you drive ~2 minutes to a lakeside picnic area on Diamond Lake you can get blisteringly fast Verizon LTE/4G service. The picnic area has tables and restrooms and our daily ritual was to take our laptops and readers down there for a couple of hours each day. The good news, however, is that if you drive ~2 minutes to a lakeside picnic area on Diamond Lake you can get blisteringly fast Verizon LTE/4G service. The picnic area has tables and restrooms and our daily ritual was to take our laptops and readers down there for a couple of hours each day. Crater Lake National Park is a 15 minute drive away and beautiful. Diamond Lake is across the street and has a wonderful bike path (11 miles) around it. Pizza place across from the entrance. Not much to do and no large grocery stores nearby, so stock up before staying here for more than a couple of days. Lots of waterfalls to see in the area. If you like to fish Diamond Lake is across the street. Great proximity to Crater Lake and Diamond Lake. Great paved path around Diamond Lake for biking. Not close to shopping so bring what you need. Fuel is available nearby but expect to pay a lot more for it than in the city. Bring mosquito repellent. They CAN be big! Crater Lake National Park North entrance is nearby. The north entrance was closed the first day we got here. The East Loop wasn't expected to open for several more weeks. Several water falls nearby that are worth the drive. Diamond Lake, Waterfalls and Crater Lake. Like the previous reviewer, I suggest put the GPS coordinates in your system. Maybe use Google Maps to locate before you take off. I used what was in my GPS and took me to the resort! Crater Lake was socked in (visibility was about 1/4 mile) when we were there. There is nothing close by in terms of shopping, just at the nearby Resort. So I recommend to shop before getting there. We didn't have time to check it out, but at the Resort down the street, one can rent a boat to go trout fishing. They also have other water activities. The highlight was an utterly clear sky with Milky Way and Constellations so visible and close if felt like we could reach out and grab them! The icing on the cake was catching a view of the fast moving International Space Station. Next time we'll bring our telescope! Checkout the nearby water falls and obviously go to crater lake. We really enjoyed the "hike with a ranger"
There are no stores nearby for groceries so bring everything you need. Diamond Lake Resort is nearby and has a restaurant and a cafe. The national park also has food options, but no store for supplies. Pizza is great at nearby restaurant. Good pizza just across the road from the campground. Be sure and go to Crater Lake, be aware there is a lot of construction on the north side entrance and within the park itself. The parking in July was impossible. Be sure and visit the Cinnamon Butte fire tower the views are unbelievable and the ranger who lives there is very friendly and informative. The 3 mile road up makes for a good hike or driving up the first 1 1/2 miles might be ok for cars but no motorhomes or trailers, 4 Wheel drive is best for last 1 1/2 miles for sure. Take a drive to the Cinnamon Butte fire lookout. You can hike up to the lookout or drive the 3 miles (4 Wheel drive would be helpful, no motorhomes or trailers) and climb the tower and visit the ranger who lives in the tower. The views are unbelievable. I also recommend the trolley tour at Crater Lake. Bring your supplies, no meaningful groceries close. If you don't need the resort's bathrooms, get a spot in the newer "W" loop; it's very spacious, but a long way from bathrooms. The "G" area is nearer the bathrooms and more spacious, as well. Great access to Crater Lk. Walking distance to shore of Diamond Lk. It is close enough to Crater Lake. Diamond lake is just across the main road. There is a small store with a few expensive groceries and good pizza and ice cream. Down the road is a small lake resort with two restaurants and watercraft rentals. Looks like that would be a fun place for kids. Fishing swimming & hiking. Diamond Lake Resort nearby. Store at nearby resort well stocked. Are you affiliated with Diamond Lake RV Park ?